(<Actual patient) Whether your teeth are discolored, crooked, chipped, short or have gaps, porcelain veneers can give you the smile you deserve. If you live around the corner or are flying in from another part of the world, Santa Monica cosmetic dentist Dr. Brightleaf can help you achieve the smile of your dreams in just 2 weeks or less. Porcelain veneers look natural, are strong and last for a long, long time. 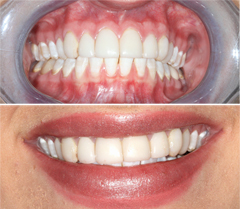 During a complimentary Porcelain Veneers Consultation we will explain the advantages of this treatment in detail. Why do we love dental veneers? 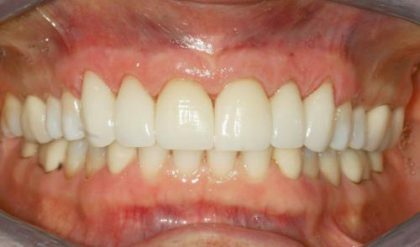 (<Actual patient) Porcelain does not discolor like your natural tooth structure. A shade is chosen to compliment your skin tone, lip shape and tone. You can choose from natural tooth shades to a Hollywood white dazzling smile. Porcelain veneers offer a convenient alternative to braces. Crooked or misaligned teeth can be corrected in just 2 weeks or less instead of months or years. Porcelain allows Dr. Brightleaf to alter the size, shape, shade, width, and thickness of your teeth. She can broaden your smile or resize irregular or uneven teeth so that you have the confidence to flash your beautiful smile in every situation. Porcelain veneers can restore and strengthen your teeth for years to come. (<Actual patient) Many patients don’t realize that porcelain veneers can, not only improve your smile, but give you a natural facelift without surgery. Porcelain veneers allow Dr. Brightleaf to add lip and cheek support by designing a smile line that is balanced with your natural facial features. In only two appointments, you can have a fully transformed smile. After your initial appointment to prepare for custom-made veneers, you only need to return for one more visit to have them placed and fitted. If you are traveling from across the country or from around the world, arrangements can be made to restore your whole mouth in a matter of 3 to 4 days.